I am not a Nikki Gemmell newbie. I first discovered her a few years ago when I stumbled across her book The Bride Stripped Bare. I liked that book enough to track down more of Gemmell’s work. 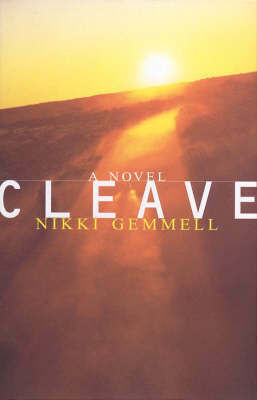 Cleave is the third novel I’ve read by her. Cleave is the story of Snip Freeman, a 30 year old Australian artist. The novel opens with Snip making a long journey from Sydney to Alice Springs in Central Australia. Snip’s grandmother has died and left Snip enough money to buy a ute (which I gather is the Australian version of a pick up truck), but she has one request: Snip has to return to Alice and find Bud. Bud, as it turns out, is Snip’s father. Finding him isn’t a problem: Snip knows where he is. Alice (and Bud) have an emotional hold on Snip. Well, lots of things have an emotional hold on Snip. She’s prickly and needy and in desperate need of the answers to some of the big questions of her life. The distance between Sydney and Alice Springs is roughly 2700km and Snip doesn’t want to make the journey alone so she puts an ad in the paper: Girl plans ute, Sydney to Alice, share the lot, now. Dave is intrigued by the ad and ends up sharing the journey with Snip. Dave becomes a major player in Snip’s life. She’s always reckoned herself a free spirit, bouncing between friends, setting up makeshift studios wherever she lands. Although he’s slightly younger, Dave is settled and he wants Snip to settle, too. Cleave means to break or come apart. Cleave is a story about fathers and daughters, mothers and daughters, husbands and wives, lovers. Although that might be familiar territory, Gemmell’s story is made new by her original and fresh prose and, for this Canadian at least, the unfamiliar terrain. Gemmell’s characters are intriguing, particularly Snip and her father. I think Gemmell’s a brave writer, too. She takes chances with her words and pushes the reader along ground that is often uncomfortable, but all the more rewarding because of it. I am happy to say that I have now completed the first book in the Aussie Author Challenge. This entry was posted in Challenges and tagged 2010, Book Review, Challenges, explicit, literary fiction by Christie. Bookmark the permalink.